CAROLINE ASTOR, the wife of William, was the first prominent and famous socialite. Her New York City balls exclusively for the wealthy are legendary. WILLIAM ASTOR (1830-1892), the son of William B. and grandson of John Jacob, William was left $25 million by his father. He was the father of William Waldorf Astor. CAROLINE and WILLIAM ASTOR. ADS. 1pp. 8" x 2 3/4". New York. May 2 1871. A check signed "Caroline W. Astor" and completely engrossed by her. 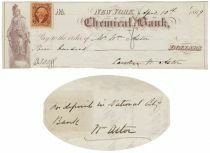 The "Chemical Bank" check paid "Mr. Wm. Astor Four hundred & sixty eight Dollars and forty-two cent". It is endorsed on the verso "Wm Astor". There is a cut cancellation that does not affect either signature and a thin ink line through Caroline's signature, but her autograph is still fully readable.